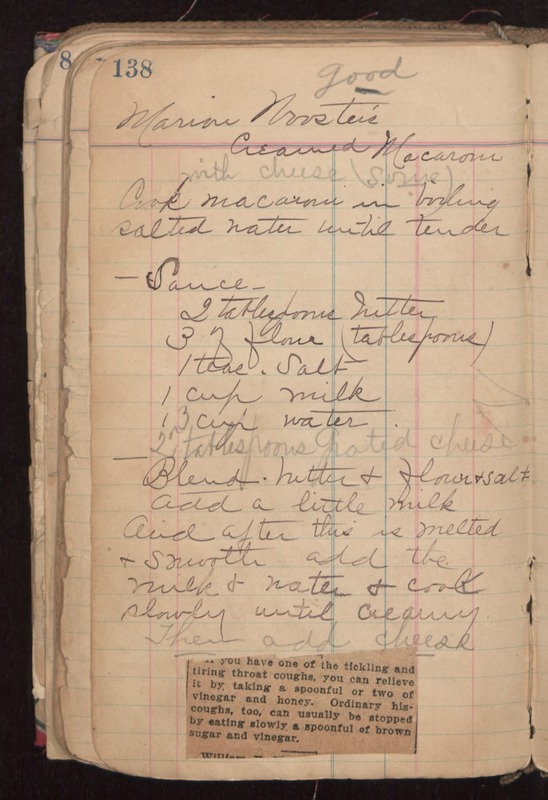 Marian Wooster's Creamed Macaroni good with cheese (sauce) Cook mararoni in boiling salted water until tender --Sauce-- 2 tablespoons butter 3 of flour (tablespoons) 1 teas. salt 1 cup milk 1 cup water 2 or 3 tablespoons grated cheese Blend butter & flour & salt Add a little milk And after this is melted & smooth add the milk & water & cook slowly until creamy Then add cheese. If you have one of the tickling and tiring throat coughs, you can relieve it by taking a spoonful or two of vinegar and honey. Ordinary his-coughs, too, can usually be stopped by eating slowly a spoonful of brown sugar and vinegar.